Plastics consumption of India is set to increase from 12 MMT to 20 million MMT per annum by 2020. The exports of plastic finished goods are set to almost double from the current $7.9 billion to $15 billion in next five years. The industry is determined to play a significant role in executing government’s vision of raising exports to $900 billion by 2020, said an apex body of plastics industry. “It seems that the centre of gravity is rapidly shifting to India due to the opportunities here. India is the world’s NEXT Plastic destination by virtue of both, its sheer size and tremendous growing domestic demand. The facts and figures say it all,” said Rajeev Chitalia, Chairman of NEC, PLASTINDIA 2018. He further mentioned that plastics consumption of India is set to increase from the current 12 million metric tonnes per annum to 20 million metric tonnes per annum by 2020. The country will deploy 180,000 machines by 2020 as compared to the current 113,000. “The export of plastics finished goods alone is set to nearly double from $7.9 billion currently to $15 billion in next five years. The industry is determined to play a significant role in executing government’s vision of raising exports to $900 billion by 2020,” said Chitalia at the launch of PLASTINDIA 2018 in Mumbai on Friday. Plastics industry would also contribute in a big way in the success of all such programs, he added. 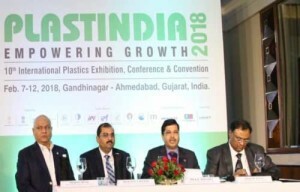 Smart cities, rapid urbanisation, increase in sale of packaged products, low per capita consumption, shifting consumer lifestyles, large young population, many manufacturing segments adopting higher percentage of plastics, etc, are contributing towards the growth of plastics industry, said Seksaria. Indian Plastics industry has geared itself to take up the challenges of quantitative and qualitative growth for serving the nation and its citizens and also to take the country to a higher growth path, he added. PLASTINDIA, which is organised by Plastindia Foundation – the apex body of the Indian Plastics Industry, is the third largest Plastics International Exhibition in the world. About 2000 companies including 600 companies from across 40 countries are being displaying their products, technologies and innovations at the exhibition. About 2,00,000 stakeholders from the Plastic Industry are expected to visit PLASTINDIA 2018, including foreign visitors from the countries of Africa, Middle East, South and Latin America, Europe and Asia.